Oh makeup, how I love you, but why are you such a biatch to remove? Seriously though, cleansing is the most important part of any skincare routine, and I've heard a lot of people talking about double cleansing (cleansing twice), but heyyyyy trust me, sometimes a double isn't enough. I go for the triple cleanse to really make sure I've removed not only all traces of makeup, but also all traces of any cleansing residue left behind. I like to start by applying a cleansing oil to dry skin to break down my makeup quickly and gently. I've been using the Superfacialist by Una Brennan Vitamin C+ Brighten Skin Renew Cleansing Oil (#whatamouthful) and it works really well. I like it because it's gentle enough to remove eye makeup and it even removes waterproof mascara. Once I've massaged this into the skin I then add water and it emulsifies and turns into a cleansing milk, which feels really moisturising. I then rinse with warm water. Because step 1 involves an oil, I absolutely have to go in with another cleanser to make sure that's removed. For step 2 I like to use a cleanser that's gonna deep clean but also brighten my skin so I like to opt for one that includes glycolic acid. 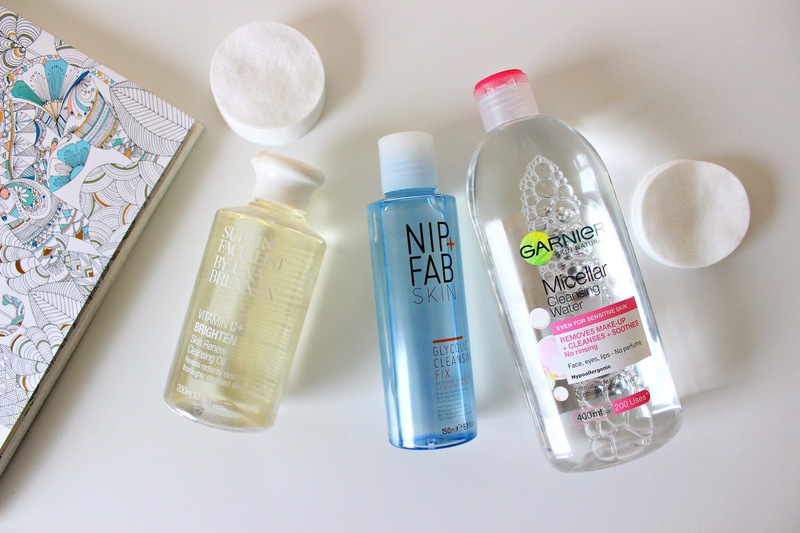 I've recently started using the Nip + Fab Glycolic Cleansing Fix and it makes my skin feel so squeaky clean and works really well at removing any traces of the oil, as well as giving my skin a deep clean and gentle exfoliation. I know a lot of people use a Micellar Water as their first step to remove makeup, but I've found this is perfect as a step 3 to make sure it removes all traces of makeup, cleansing oil and any other residue ready for hydration. I've just started using the Garnier Micellar Cleansing Water, and I really love how gentle and soothing it is on my skin. I'll be honest though, I've used a few different Micellar Waters in the past and haven't really noticed much difference, so I think any brand would probably do the same job.